Hey Guys! Hope your day is going great and this post brings a smile to your face. 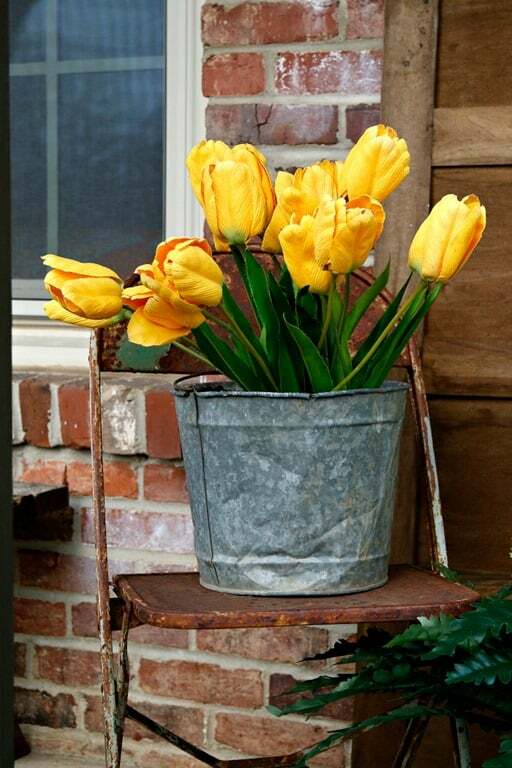 I went with yellow for the color scheme when decorating our front porch for the Spring Ideas Tour. I did as usual and gathered a few of my junk treasures and went to work. 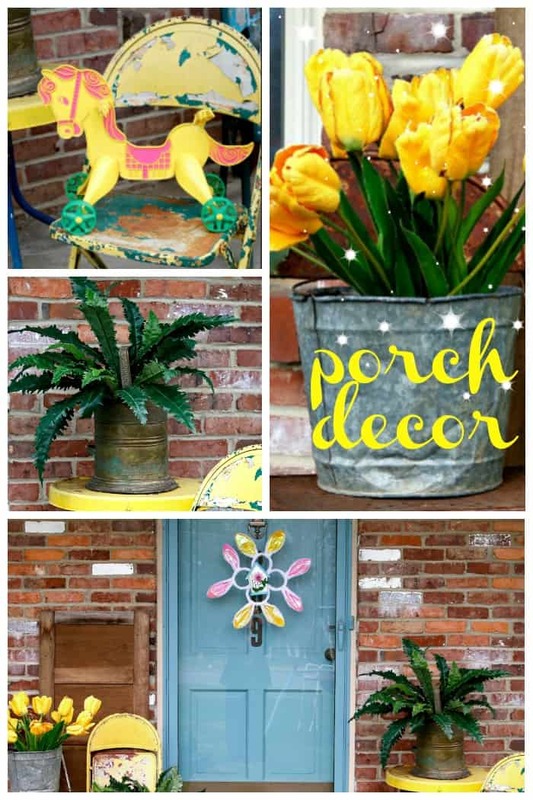 My yellow front porch décor is sunny and bright and makes me feel like doing the happy dance. First I have to let you in on a little secret. All of the greenery and the tulips are artificial. The weather is still a bit cold here for the potted plants I usually buy in the Spring so I’m faking it for now. 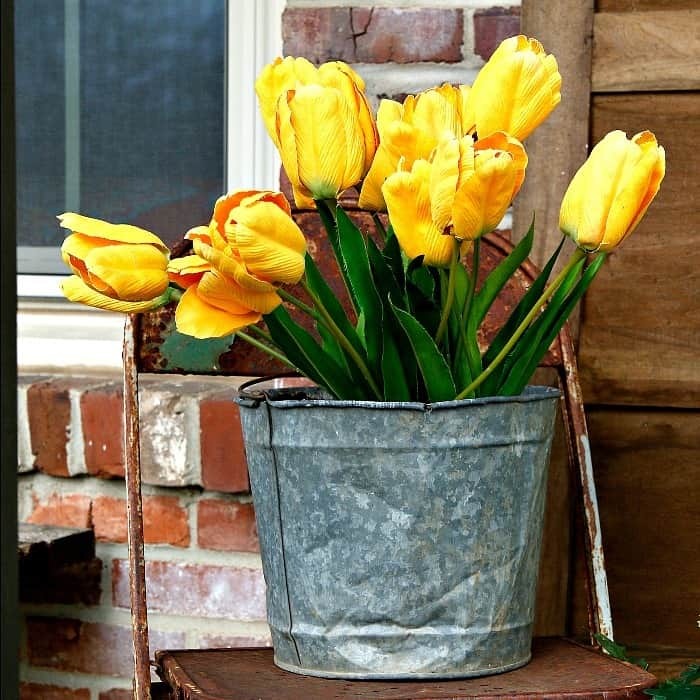 The yellow tulips on the beat up galvanized bucket have been around the house forever. I don’t remember where I bought them or when. The color is so bold and they are one of the things have survived my many junk purges. Here is a look at the whole shebang. 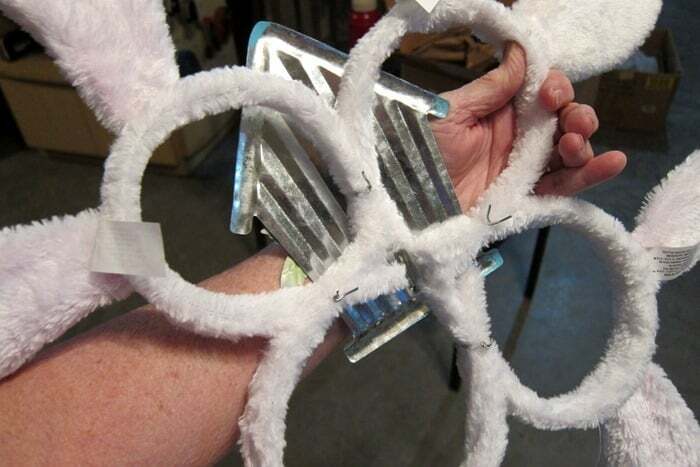 I bet you can’t wait to hear the bunny ears “wreath” story. I have the whole tutorial further down in the post. 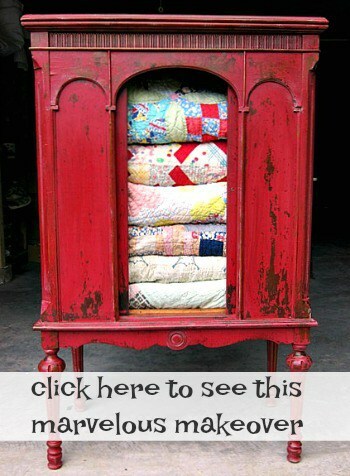 Most of my junk décor comes from flea markets, auctions, or thrift stores. 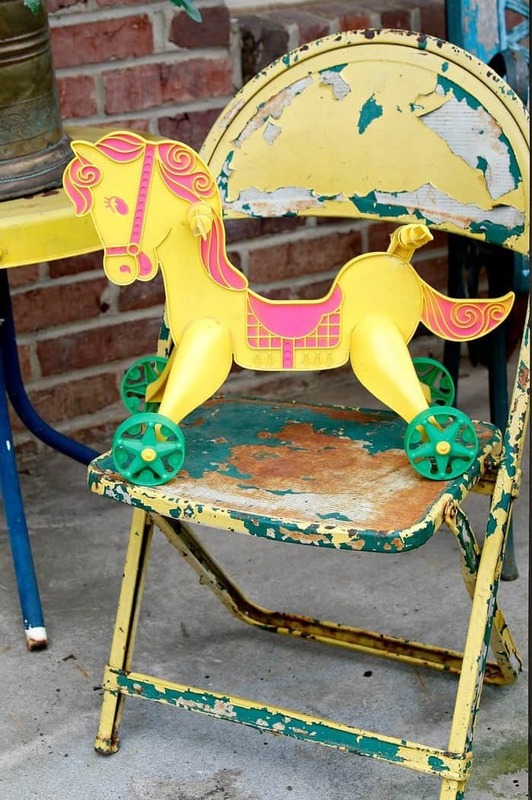 The rusty yellow kids chair came from the shop where I have one of my booths. There were a pair of chairs and one kids table. The table was ugly brown and I sold it. Can’t get rid of the chairs because they are chippy paint perfection. The toy horse is an auction purchase. I buy the craziest things. Anything with bold colors catches my eye. Even though I love Farmhouse style, meaning pretty white stuff, it’s just not me. Yes, the ferns are all artificial . I went to Hobby Lobby hoping to buy a few ferns at 50% off but they were still pricy and a bit small. 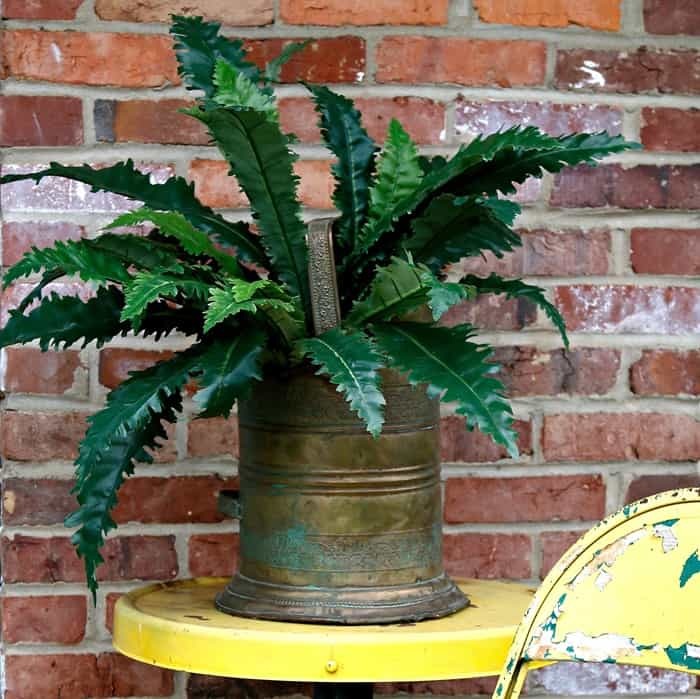 I found this fern in with the regular priced ferns and it was marked down from $21.99 to $5.49. It looked so much better than the other ferns. I went on a hunt for more hoping this wasn’t the only one left. It wasn’t, I found a few more on another aisle and bought 3 of them. The copper coal scuttle is from an estate sale in Nashville. I don’t remember how much I paid for it I just remember it was over my budget but I had to have it anyway. That wreath is kind of cute isn’t it. Not my usual style but it is bright. The rusty folding chair has a punched out star design in the seat. That’s my favorite part and you can’t even see it. The turquoise bucket is from IKEA. The Memphis IKEA is at the half way point in the drive to my parents home in Arkansas. I sometimes stop and shop when heading home. It’s a bad habit. The toy tricycle is another auction buy. 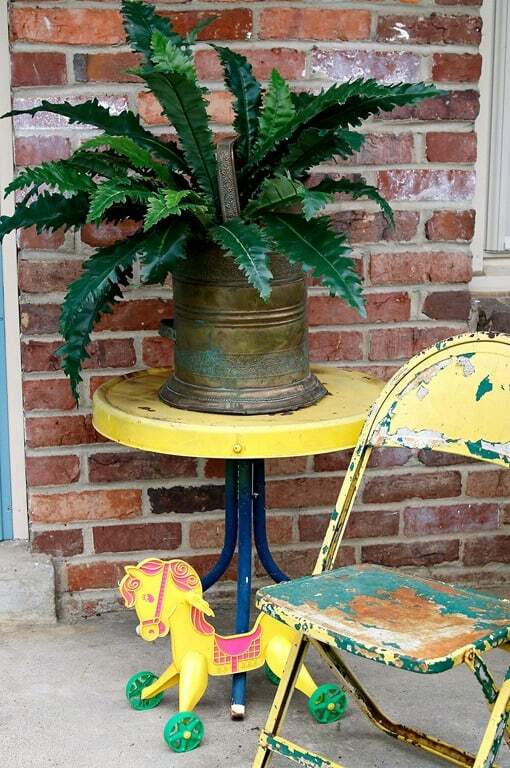 The yellow topped table came from my favorite junk shop and usually sits by the workshop garage door where I work on projects. I forgot to lay a wood panel across the top one day and it got spray painted with copper paint. Okay, are you guys ready for the wreath story? 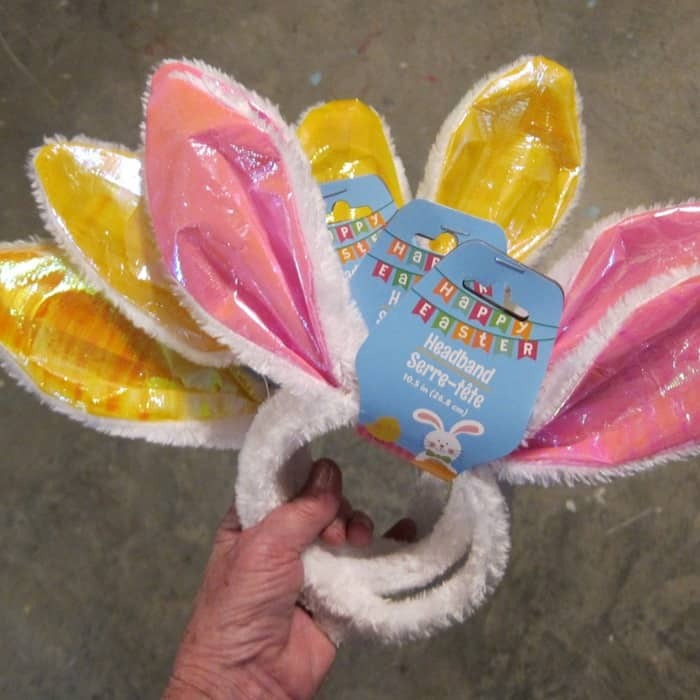 I was shopping in the Dollar Tree which is one of my favorite stores and I saw the bunny ears headbands. I immediately saw a wreath. 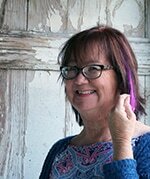 I wired the headbands together down towards the ear end and twisted the wires tight with wire pliers. I also bought two decorative garden stakes at the Dollar Tree. 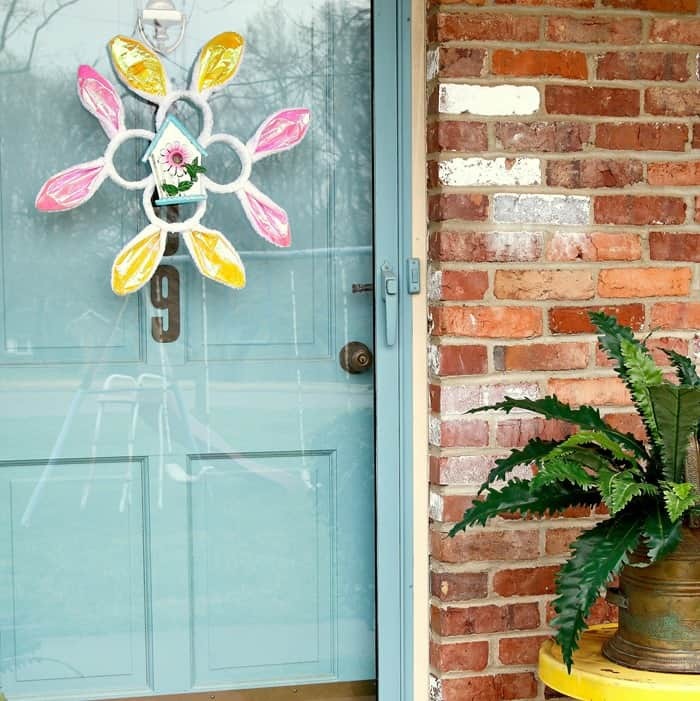 I decided to place the birdhouse in the center of the bunny ear wreath because everyone knows birdhouses and bunnies go together, right. I slipped the wire from the birdhouse over two to the wired together bunny ears and was all set. I guess the wreath cost $5 plus tax. That’s the wreath story and you saw all of the porch décor. What do you think? Nice combination of old and new. Now it’s time to take the Spring Ideas Tour. 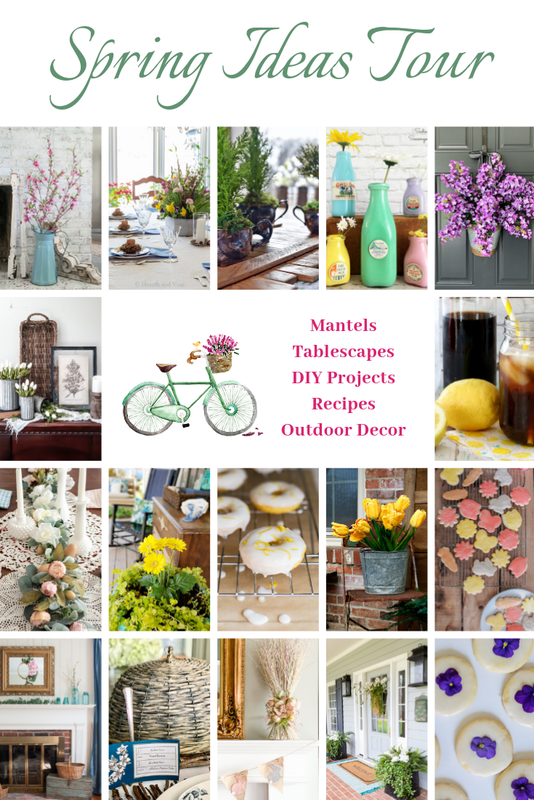 The tour started Monday with mantels, then we had tablescapes, DIY projects, recipes, and porches or outdoors. I’ve followed the tour all week and the projects are great, the recipes too! To take the tour just click the Blog name below each group of photos. Have fun! Love the yellow touches and the “grunge” – so pretty! Your kids toys actually went with a doll from the late 60’s. Tippy Toes! She could ride the trike and ride or push the horse. I had one that was “lost” when we moved overseas. (Army Brat) It was fun to see them! I don’t blame you for keeping the chippy chair, it’s perfect! That wreath is too cute, very clever! 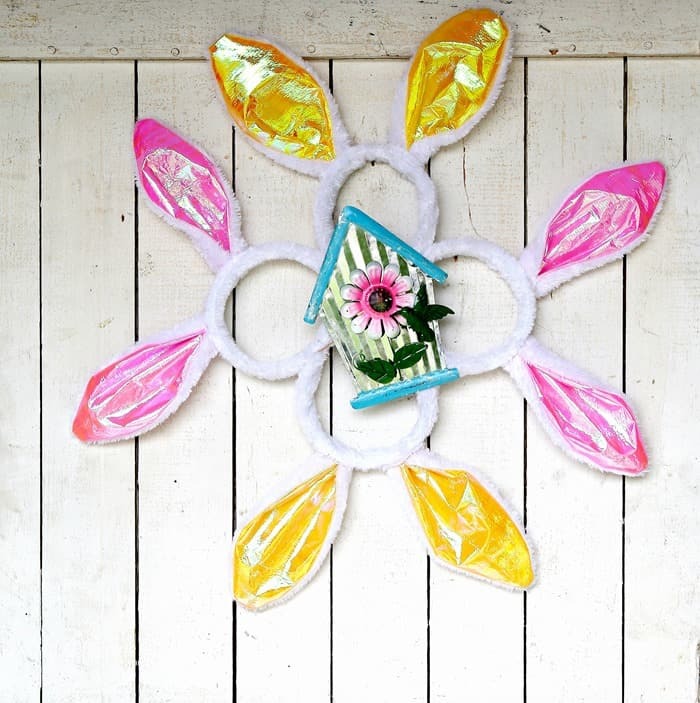 Absolutely love the bunny ear wreath! I never would have thought to do that. Very creative! I will make one for sure. 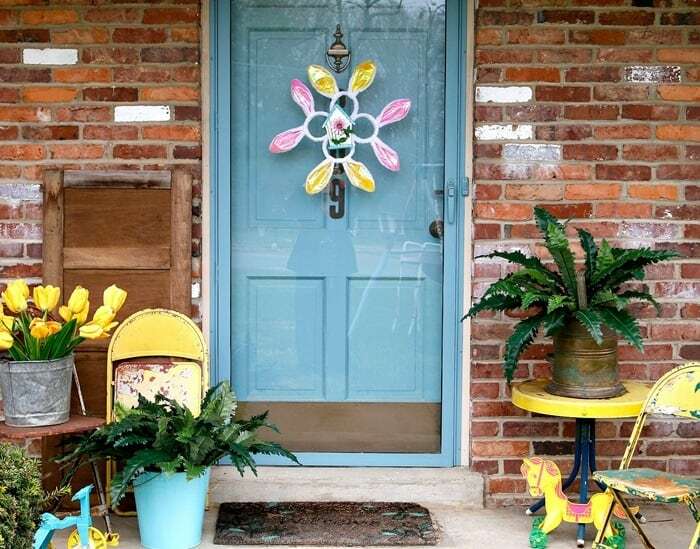 Yellow is the perfect color for spring and I just love that bunny and birdhouse wreath. So festive and creative! I really like the bunny ear wreath. 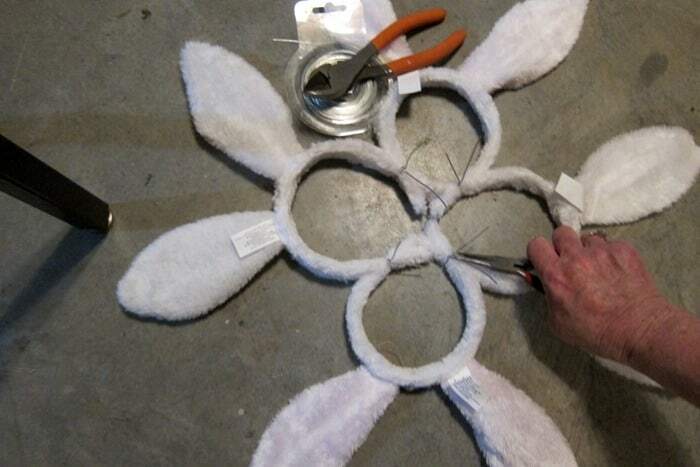 How neat you saw the bunny ears and saw a wreath in the making. I might tried that one. That bunny ear wreath is adorable!!! 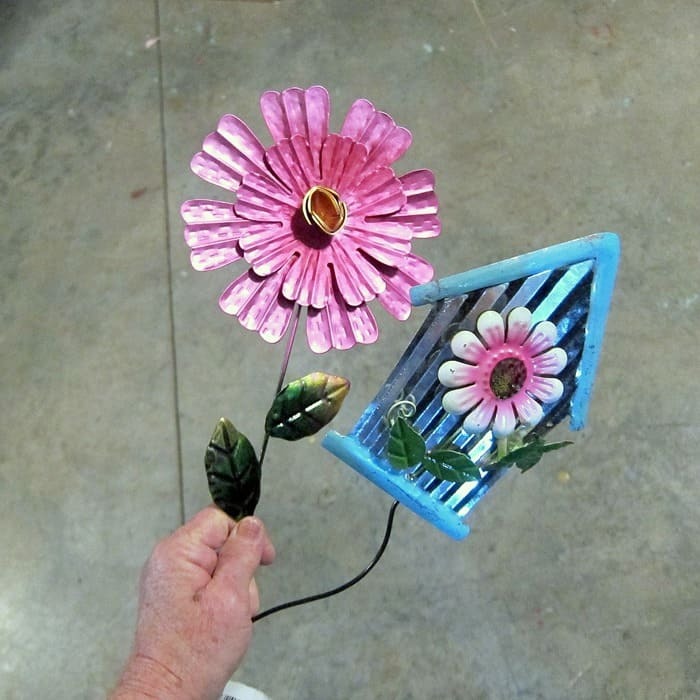 What a great, whimsical idea! You are so ahead of me on spring decorating but all your great ideas are inspiring me! Love the yellow! It’s amazing how you put all this random stuff together and make it look so welcoming and festive. Always look forward to your posts! I think the wreath and decor are so cute! You really made me smile today! 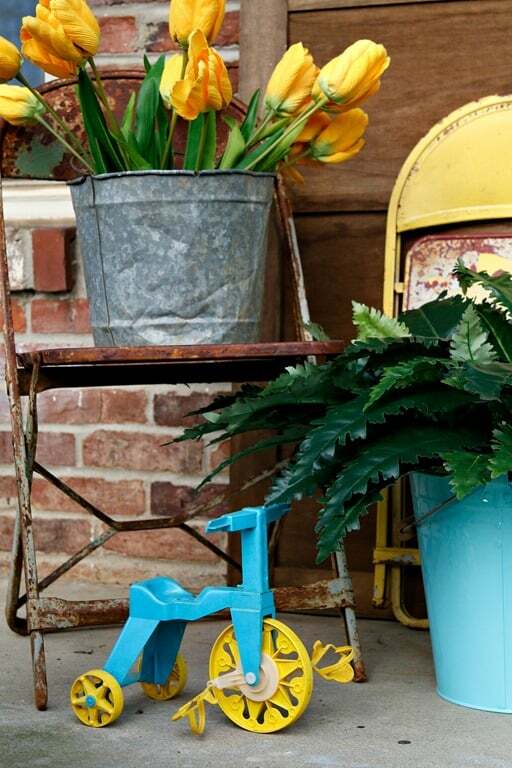 I love seeing all of your vintage treasures on your porch, Kathy! The two colorful kid toys that you included are so cute and they add both color and whimsy. 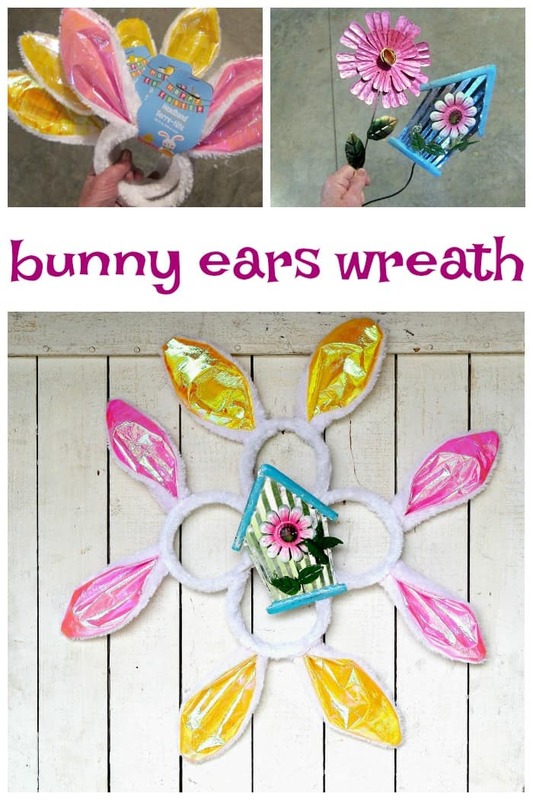 Your bunny ear wreath idea is genius and so cute! It’s a little too early here to buy flowers just yet, so I understand using faux. I honestly wouldn’t have known that they are faux if you hadn’t spilled your secret.